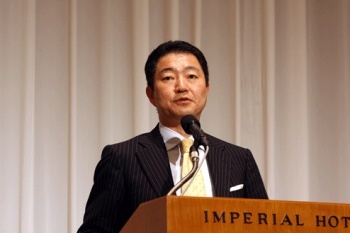 Square-Enix boss Yoichi Wada has once again taken his countrymen to task for their bias against Western-made games, but this time he's levied his complaints against retailers who refuse to carry the games in the first place. Maybe it's just that Square-Enix acquired decidedly Western developer Eidos last year, but for whatever reason, Squeenix CEO Yoichi Wada seems to have a real grudge lately against the Japanese game industry for their refusal to give Western games a chance. Back in December, he called out Japanese gamers on the term youge- for Western-made games, which he said was "discriminatory" in that it implied that they weren't actual games. In the same Edge interview in which he discussed the end of Final Fantasy as we know it, though, Wada said that the brunt of the matter rested on the shoulders of not the gamers, but the retailers who refused to stock many of the games in the first place (or, if they stocked them, they didn't promote them). Despite being a foreign game, Wada thinks that a title like Batman: Arkham Asylum is absolutely one that fits Japanese tastes - it's Metal Gear Solid, but better. "Well, actually, I've found the person that is prejudiced is actually the retailer and not the actual players ... the retailers have a prejudice against overseas titles, and they won't procure them. But something like Batman: Arkham Asylum, for example, is something that is very like the Japanese taste in games, in fact it caters to very much the Japanese taste." "Arkham Asylum is like the best aspects of Metal Gear Solid, but evolved." I dunno about that, Wada. I mean, Batman doesn't even have a mullet.